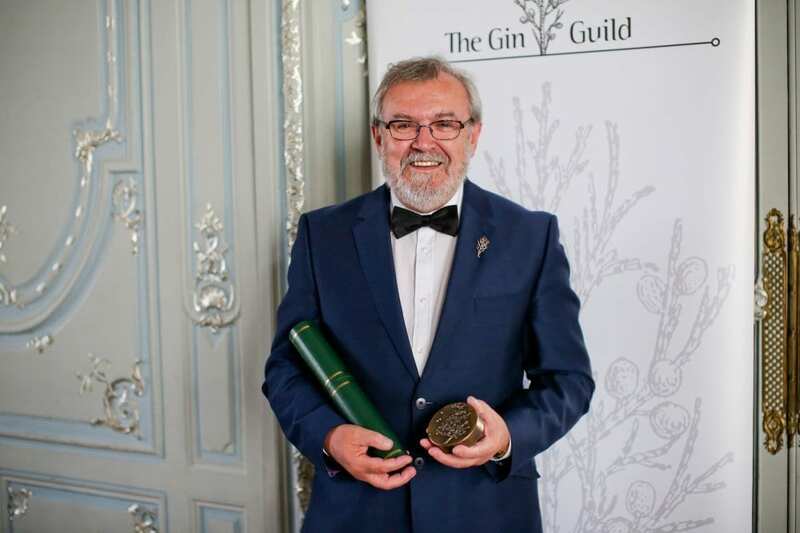 Tanqueray Master Distiller Tom Nichol received the Gin Guild Lifetime Award surrounded by many of his peers and gin industry colleagues at the Gin Industry Annual Dinner on 28th May 2015. Tom Nichol is retiring after 42 years of service. He has an unrivalled knowledge in spirit making. Tom started in the drinks industry more than 42 years ago. Tom took up the position of Master Distiller of Tanqueray in April 2006. It is Tom’s role to personally oversee the selection of the finest ingredients for Tanqueray, managing every stage of the distillation process. Tom has said: ‘Everything I have learnt throughout my career has helped me reach the ultimate pinnacle of becoming Master distiller of Tanqueray. My role is all the more rewarding because gin is the most complex spirit to distill and Tanqueray is a most colourful and rich, vibrant & rewarding gin”. 100 members of the Gin Guild and their industry guests attended the Gin Industry Annual Dinner in Mayfair . The Guild installation (25 new members joined the Guild) again demonstrated the continuing expansion of our fast growing trade body. It was gratifying to see that the event was sold out in early April, such was the demand. The post dinner ‘alternative speaker’ took the form of a short presentation about 1495 Gin (the earliest gin recipe found to date) by Philip Duff, followed by a rare and privileged tasting and notes of 1495 (both the ‘recreation’ and the ‘interpretation’) by Jean-Sébastien Robicquet (Président Directeur Général EWG – Spirits & Wines). Guild members hail from the UK and beyond, in recognition that gin is international and that those in the gin trade are both like-minded and enthusiastic to develop and benefit from their own Guild. The Guild continues to grow and promote the worldwide growth of the gin category and excellence in gin distillation. Education for both industry and consumers, together with category awareness, are key pillars of the Guild and will help drive the gin category. The Guild again presented two seminars at the Wines and Spirits Educational Trust in February and March, which saw forty delegates (including several WSET Diploma candidates). Our second one-day trade orientated Ginposium (see www.ginposium.com), specifically aimed at the drinks industry was another success. The Guild was once again very fortunate to have the support of a number of key speakers. Attendees were, extended their understanding and knowledge of the complexity and rich variations that exist within the gin category.